It is my sad duty to inform you that we have lost one of our own. John S. Berry, the man who invented a little product called WD40 passed away peacefully in his La Jolla earlier this month. His memory will live on in every none squeaky door. 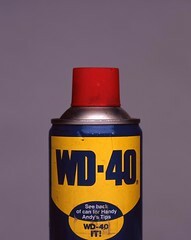 For those of you that don't know WD40 stands for "water displacement, formulation successful in 40th attempt." Check out Jay Leno's BSA. Good to see that he's knowledgeable about his collection. Welcome to SF Vintage Cycle! Please take the time to peruse our website. Shop through our inventory of parts and products. Browse our Events page for news on upcoming vintage motorcycle events in California. Check out our photos page for pictures of motorcycles, cars and other cool stuff.